Providing assistance to the Kosovo Energy Regulatory Office (ERO) to strengthen, clarify or develop as needed key regulatory or legislation-related documents so that energy regulatory transaction-specific commitments effectively support privatization of KEK Disco while ensuring Kosovo’s national development interests, including post-privatization implementation support. Providing assistance to the Transmission System and Market Operator (KOSTT) to review and revise, as needed, proposed implementation arrangements related to market design, market rules, grid and other technical codes, and related financial settlement mechanisms between and among market participants to support privatization of KEK Disco and ensure effective post-privatization implementation. Providing technical assistance to support the privatization of both new Kosovo and KEK’s electricity distribution and supply functions. Carrying out an independent study of KEK 2010 commercial and technical losses. AEAI established and chairs an informal technical Market Model Working Group with representation from the regulator, System and Market Operator, EC Advisors to both of these bodies, the Generation Transaction Advisor (TA) and DeloitteTouche Tohmatsu (DTT). The Working Group (WG) seeks to form a consensus of the advisors on valid and feasible market design options that will provide a stable investment environment for the power sector, comply with Kosovo’s Athens Treaty commitments, and facilitate future security of supply. Under AEAI’s WG chairmanship, secured stakeholder agreement to an Options Paper describing and narrowing down the market design options available to the Government of Kosovo (GoK) for structuring the electricity market around the two proposed transactions and highlighting their strengths and weaknesses, together with a recommendation as to the preferred option. After the Generation TA drafted a Concept Paper for GoK approval based on the agreed “option” identified in the Options Paper, AEAI facilitated discussions with the EC’s Electricity Directorate (ED) to: (a) explain the rationale for the Concept Paper in terms of attaining security of supply; and (b) secure its confirmation that the Concept Paper outlined a design that conformed to Kosovo’s Treaty obligations. AEAI sought and obtained the ED’s clear statement of acceptance that Kosovo was not required to comply with obligations beyond the 2nd Package, which removed objections by the regulator and the EC Liaison Office in Pristina to the draft concept paper and enabled the GoK to approve this option without risking Treaty non-compliance. AEAI, working with Deloitte, drafted proposed modifications to the three energy-related laws (Law on Energy, Law on Electricity, and Law on the Energy Regulator) to reflect the approved Concept Paper and to remove the more costly and problematic 3rd Package elements. The detailed provisions of the revised laws were discussed with the Energy Community Secretariat and its non-objection was received. The three Laws were approved early in September 2010. Following a request to USAID from the IFC (i.e., the KEDS TA), AEAI undertook an Independent Losses Study in October 2010 to verify the value of technical and commercial losses declared by KEK and the methodology by which those values were derived. The Final Report was issued to the Regulator and provided to the Data Room as part of the transaction process in May 2011. At the request of USAID, AEAI reviewed the written arguments of the two network operators, KOSTT and KEK, for and against retaining the current Government Decision on the division of technical network assets around the 110-kV boundary as opposed to moving the distribution boundary upstream. In March 2010, AEAI prepared a reasoned opinion for USAID which found that there was no material technical or operational reason to move the boundary upstream. In late 2010, the IFC’s Technical Advisors, PB Power, issued a paper argument to move the boundary downstream. USAID again asked AEAI to review and provide an opinion. In February 2011, AEAI concurred that a downstream shift as proposed had technical and operational merit. A discussion paper setting forth 18 recommendations for improvements to the overall tariff methodology was presented to the ERO to provide a more stable and investor-friendly approach to price regulation. The paper recommended changes to several key documents including the Tariff Methodology, the Pricing Rules, and the Regulatory Accounting Guidelines. After discussions with the ERO, AEAI prepared modifications to the secondary legislation. Independent advice to the GOK with respect to recommendations made by KEDS transaction advisors and in regard to the Kosovo e Re power plant transaction as it related to the KEDS transaction. Assistance to the GoK in developing commercial solutions for key transaction framework issues, such as commercial debt collection, energy supply to northern communities, and employment of KEDS workers, to be approved by the PC. Assistance to the GoK in preparing transaction-related documents such as: draft purchase agreements, rules and procedures, draft information memoranda, share purchase agreements, etc. AEAI provided more than 16 training and capacity building workshops for the regulator, ERO, focused on tariffs, price setting, and the implications of privatization for the ERO. It substantially supported ERO on pricing and charging, including support in the development of new ERO regulations on the methodology by which it will determine revenues. AEAI helped draft a set of charging principles for networks and supply, which were promulgated by ERO in 2012. AEAI supported ERO in carrying out a multi-year tariff review as required under the new pricing rules, replacing the earlier annual price setting process. The change required an in-depth analysis of licensee cost, but led to more robust allowable revenue and gave ERO a greater level of knowledge on which to base sound regulatory decisions. AEAI also supported KOSTT in 2012 and 2013 in developing draft market rules and detailed procedures aligned with the new market design. 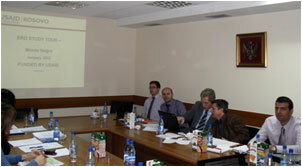 in Kosovo: Energy Regulatory Office (ERO) Workshop in Montenegro.